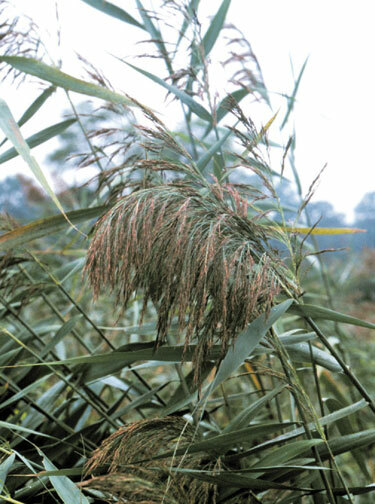 History: Common reed is an aquatic perennial that is part of the grass family and has several different strains. One strain is native to North America and another is native to Europe. The European strain is much more aggressive and invasive. It is believed that it reached America in the early 1800's by contaminated material in ship ballasts. Roots: The root system of common reed is extensive and consists mainly of rhizomes. Root hairs extend off the nodes of the rhizome and the whole system can expand downward for up to six feet. The rhizomes are the main method of reproduction. Stems and Leaves: Common reed has woody, hollow, stems that can reach heights of 15 feet tall. The leaves are blue green in color, unlike the native strain which is lighter colored. They can be one to five centimeters wide and 20 to 60 cm long. Flowers and Seeds: The stems end in panicles, or bunches of spikelets. Each spikelet has up to seven flowers which are less than an inch long and range from purple to gold in color. The spikelets can be one to sixteen inches long and give the tops of plants a feathery look. When the flowers die they are replaced by gray, silky, hairs. Each plant can produce thousands of seeds but most are not viable. Methods of Reproduction: Common reed reproduces mainly through root fragmentation or rhizomes that are carried downstream. Most seeds aren't viable but occasionally some are carried by wind, water, or other means and establish a new stand. Environments Favorable for Infestation: Common reed occurs in disturbed wetlands, roadsides, ditches, lakes, rivers, brackish and freshwater marshes, and areas with moderate salinity. Common reed also prefers areas with full sun. Environmental Impacts: Common reed is aggressively invasive so it out-competes native plants for space and it even chokes out the native strain of common reed. Common reed grows in dense stands forcing out wildlife because they can't get into it to hide or make nests. The stands are so thick that they can alter water flow and interfere with circulation. This also poses a great fire danger when the stalks die and dry out. Range: Common rush, both native and invasive, are spread throughout most of the U.S. but considered noxious in: CO, CT, DC, DE, GA, IN, KY, MD, MI, NC, NH, NJ, NY, OH, PA, TN, VA, VT, and WI. Prevention: Do not spread the seeds by vehicle, clothing, or pets. Wash all equipment and brush out all pet fur to get rid of the seeds that may be attached. Mechanical: Cutting, disking, mowing, dredging, and flooding could potentially be short term controls but usually result in shorter, more dense stands because of rhizomes breaking free. Cutting was found to be most effective but it has to be done repeatedly and all the cut stalks must be removed. Cultural: Horses, cattle, and goats can graze common reed but they are not particularly effective in controlling it. Biological: There is not currently a bio-control agent approved for use in the U.S.
Chemical: Rodeo and Glyphosate can be used after the plant flowers in late August to early October. Other: Prescribed burning can be a form of control however it does not get rid of the rhizomes. 1. "Common Reed." Common Reed. Web. 11 Aug. 2015. <http://www.fcps.edu/islandcreekes/ecology/common_reed.htm>. 2. "Common Reed." Noxious Weed Control Board (NWCB). Web. 11 Aug. 2015. <http://www.nwcb.wa.gov/detail.asp?weed=101>. 3. "Invasive Species: Aquatic Species - Common Reed (Phragmites Australis)." Invasive Species: Aquatic Species - Common Reed (Phragmites Australis). Web. 11 Aug. 2015. <http://www.invasivespeciesinfo.gov/aquatics/commonreed.shtml>. 4. "Skip Menu." Identification and Control of Common Reed (Phragmites Australis) in Virginia. Web. 11 Aug. 2015. <https://pubs.ext.vt.edu/427/427-101/427-101.html>. 5. United States. National Park Service. "Common Reed (Phragmites Australis)." National Parks Service. U.S. Department of the Interior. Web. 11 Aug. 2015. <http://www.nps.gov/plants/alien/pubs/midatlantic/phau.htm>. 6. "Weed of the Week." Web. 11 Aug. 2015. <http://www.na.fs.fed.us/fhp/invasive_plants/weeds/common-reed.pdf>.